Nick’s brother was kind enough to send three boxes of Omaha Steaks for his 29th birthday. And then Sam was born and the weather turned cold and we lost our desire to grill outdoors. Enter the broiled steak salad! I’ve had this bookmarked since Kate and Rachel blogged about it last year. This dish couldn’t be simpler to prepare, and it makes use of vegetables that you may already have in your refrigerator. We combined cherry tomatoes, white potatoes, asparagus, and shallots. You could also try brussels sprouts, parsnips, turnips, or onions. 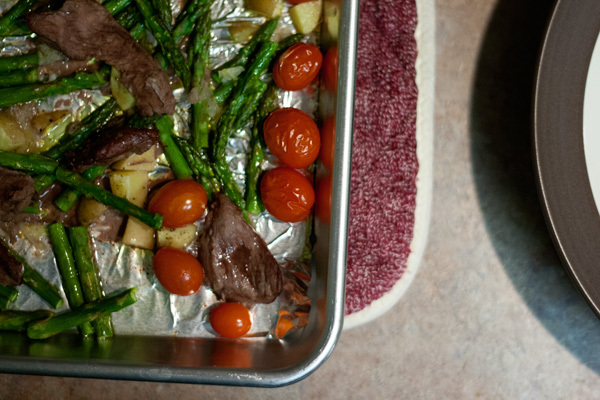 Toss the steak and veggies together with a bit of olive oil and spread everything onto a foil-lined sheet pan. 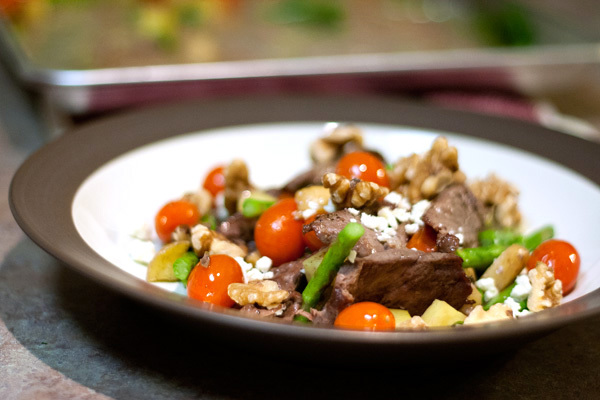 Broil for about 5 minutes on each side, then slide into a serving bowl and top with Gorgonzola cheese and walnuts. The steak is perfectly tender, and the flavors are fresh and natural. This is definitely a repeat dish. Fortunately, we still have quite a bit of steak in the freezer! What’s your favorite steak dish? Preheat the oven to broil. Transfer a rack in your oven to the uppermost spot. Place the steak on a foil-lined baking sheet. Scatter the tomatoes, potatoes, asparagus, and chopped shallot across the baking sheet. Drizzle everything with olive oil, sprinkle with salt and pepper, and place in preheated oven. Broil the steak on one side for 4-6 minutes (you’ll know it’s ready to flip when the edges of the steak begin to brown slightly). Flip the steak over and return the baking sheet to broil until the steak is cooked to your favorite doneness (it should take an additional 4-6 minutes to reach medium). Remove the pan from the oven and allow it to rest for 10-15 minutes on your stovetop. 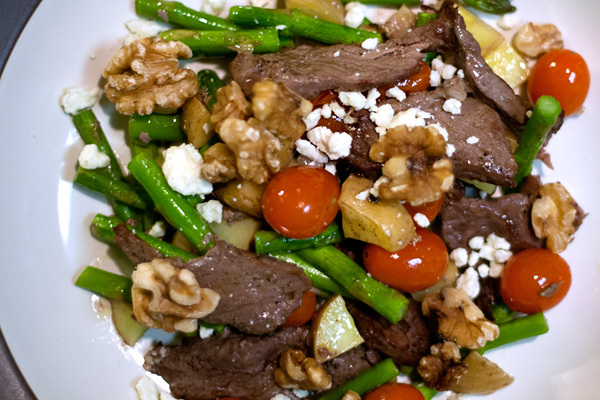 Sprinkle with Gorgonzola cheese, walnuts, and extra ground pepper before serving. This looks so good!! I will definitely try it. What a great gift for guys! I’m going to have to remember that one. This salad looks delish, too. I never broil meat for some reason. It feels easy to overcook it or something? Even though I know it’s not supposed to be much different from the grill.